Why a Conquer vertical climber Machine? The market for home fitness equipment has exploded as increasing number of busy people find making time to travel to and from the gym an unnecessary time waster. Vertical climbers are joining treadmills and stationary bicycles as preferred equipment for home use. What is Conquer vertical climber? The Conquer vertical climber fitness climbing machine is fitness equipment that mimics natural climbing such as wall or rock climbing. It gives full body workout. It is a good way to work the legs, shoulders, arms, the body’s core, and glutes. The workout is very good, offering a combination of both aerobic and anaerobic workouts. Customers have reported losing tummy fat with this climbing machine. It is well built, sturdy and strong. It fits into a small space, so it is a great choice for home use. It is a great way to keep in shape during winters too. The design is slim, which can give one worries that there is a risk of it tipping over. However, customers find it very stable and fears of possible tip over have been ruled out. The Conquer vertical climber fitness climbing machine is easy to fold and store away though it is a bit heavy but movable. It is not suitable for frequent moving. It can comfortably fit in a corner or under the bed when folded. Folding has not been rated too highly by customers, with some complaining that there was some imperfection in the frame and if not careful once could end up injuring a finger in the process. The Conquer vertical climber fitness climbing machine is fairly quiet with the only noise being made by the bicycle-type chain on cog used to make this climbing machine run. Some customers have reported that there is a bit of rattling from some parts such as the handles especially when they are not held during exercise. This climbing machine gives customers better value since the cable that is used with a pulley on other types of climbers wears out frequently, unlike the chain. There is no mechanical operation of the equipment, so the body does 100% of the workout. Combined with other fitness equipment, it is a great addition to one’s fitness program. It can serve as a warm up before weightlifting. It offers the benefits of burning calories, toning of muscles as well as strength training. The workout is not very easy, and most customer reviews indicate that it is difficult to sustain it for more than just a few minutes unless one works hard at their fitness levels. First-time users feel the burn in their legs and break out in a sweat in as little as five minutes or less. It provides low impact but high cardio. This equipment is a great way for people with injuries such as veterans or injured athletes to keep in shape. It is also practical for those who are not very young because it is not tough on the joints such as the ankle and the knees, unlike other equipment for home use such as treadmills. It is a great starting point for those who are not in shape as they can start slowly and gradually increase the speed and the length of the sessions as they get fitter. The package comes complete with assembling tools though one can also use existing tools in the house such as a screwdriver. The manufacturer sends an email giving a link to an assembling manual. It is also possible to access a video that gives guidance for assembling, either from the company’s website or YouTube. Some customers did not find the instructions useful. The print on the instructions that come with equipment has repeatedly been rated as too small to read comfortably. The explanations have also not been rated too highly. Customer reviews say that the instructions manual could do with some improvement. The manufacturer indicates that assembling is easy, but many clients claim that they did not find it that easy. Some required an extra hand when assembling. Customer care and support come out as a very strong point, with most customers mentioning it as a very strong point with the Conquer climber sales. The product is delivered promptly, and the manufacturer follows up to ensure customer satisfaction. Cases of complaints about a part that was broken during transit were also handled to the customers’ satisfaction. How Does Conquer Vertical Climber Compare with Maxi Climber Vertical Climber? Maxi climber has dominated the market of vertical climbers. The Conquer Vertical climber is an entrant in the same market, promising customers services of similar value. How do the two compare? Maxi climber uses a pulley system while Conquer uses a bicycle-like chain, which is not only less noisy but longer lasting too. Maxi climber comes with a digital tracker that shows the calorie count, which is not available with the Conquer climber. Customers find it unnecessary to spend more to have a timer since a smartphone can do an equally good job. Maxi climber gives 30-day money back guarantee plus 12 months warranty while Conquer vertical climber gives a very short warranty of only 60 days. Conquer vertical climber withstands more weight than Maxi climber, which is frailer. Conquer vertical climber gives a rather quiet workout, unlike Maxi climber who is noisier. 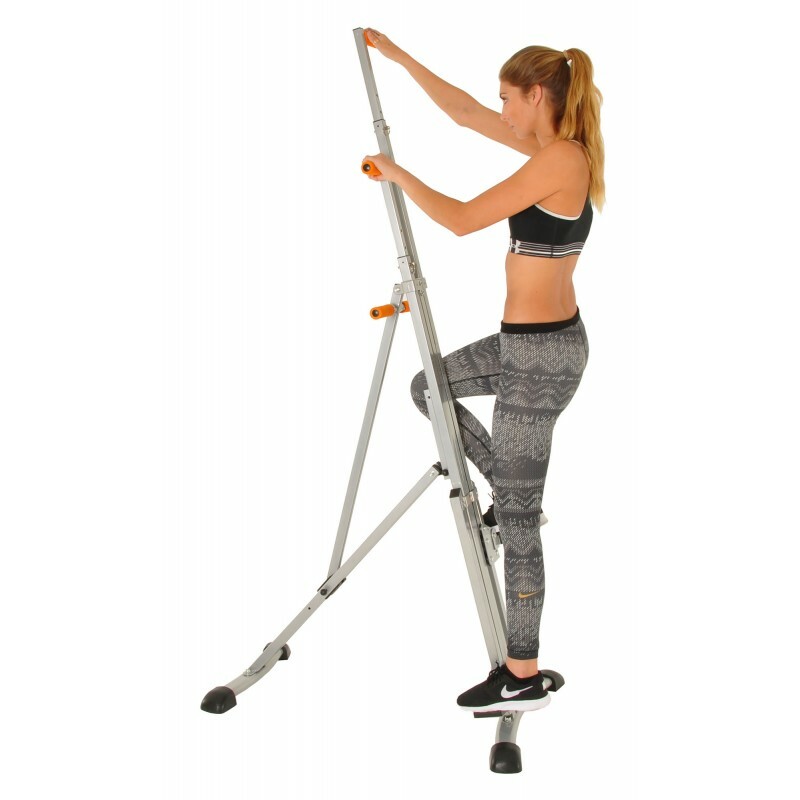 Conquer climber has no tension control unlike the Maxi climber, so workouts cannot be varied. Conquer climber is more sturdy and larger than the Maxi climber. Conquer gives better value for money than Maxi climber because both give the customer just about equal service. Customer reviews for the Conquer vertical climber fitness climbing machine indicate that there is a high level of satisfaction from customers and that they find the product a good value for their money. A few customers complained about the quality of the plastic that is used on the handles and the antiskid pieces, citing it as not of very high quality and that it has an unpleasant smell. The foot pieces are not very comfortable and are not suitable for use with bare feet. There have been a few complaints about some parts breaking after just a few months of use. In a few cases, the equipment has got to the customer with some breakage. That could indicate that some parts are not too durable and with a rather short warranty, that could be an area of concern. Some customers found that replacing the handle grip with bicycle grips as well as getting some non-slip tape to use on the footplates solves some of those minor problems without pushing the overall cost too high. The Conquer vertical climber fitness climbing machine is one of the least expensive in its niche and works as well as any other. Many customers rate this product as a great buy for the price. Explore more to know about Versa climber.